Part 1 dealt with making a plan and decision to sell structured settlements. Part 2 is about asking a free price quote for cash for your payments. Now to part 3. When you are done with the second step and have finally made a decision how to sell structured settlement payments, whom to sell to and at what price, it is time to move on to step 3 of the sale process. At this phase, you'll be requested to find and hand over copies of your original structured settlement agreement and release papers signed with the defendant's insurance and the issuer of the structure settlement annuity payments. You may still have copies of these important documents that you have received at the time of settling your case with the defendant and signing agreements with your personal injury and structured settlement lawyers, the defendant's insurance and the annuity issuing company that were assigned the liability to pay out the future periodic payments to you. Alternatively, you may get in touch with your personal injury attorney or the annuity issuing insurance company to request a copy of the papers (the released and assignment papers are written agreement documents to release the defendant's insurance from any further liabilities and assign the responsibility to the life insurance company who is buying an annuity with the money paid to them by the defendant's insurance and is subsequently sending out the periodic payments to you). The structured settlement buying company may as well be of help to you in obtaining the important documentation. You will also need to send your personal identification papers to the company that is buying the structured settlement payments from you to confirm your identity. The buying company will then do its work to study your situation, the case and settlement, eligibility of a potential transfer and the probability of obtaining court approval for the sale. In the next move, they'll get in touch with you to discuss all the details and provide full disclosure, fees and price information. They'll send you documents and contract papers to sign and notarize. Take your time and don't let yourself get rushed anywhere. Review all the details carefully and don't sign before you are completely sure you understand everything in full. If you have any questions or issues to clarify, pick up the phone and discuss. Request full and detailed explanations and answers to all your questions until you are entirely sure you understand everything perfectly. Confirm there are no additional or hidden charges. If your questions are not being answered satisfactorily, if the representatives of the company can't be reached easily, if your phone calls and emails go unanswered, if time is being dragged on, company representatives company sound unfriendly, inpatient, dishonest, aggressive, pushy, attempting to push, hurry or force you into the sale, say goodbye at this point and look elsewhere for a deal. You can't and shouldn't be rushed into a sale before you are fully ready and prepared for it. Other funding companies will be more than happy to hear from you. Finally, once you feel up to it and ready to go for the sale, and you are sure you already know and understand everything, you can sign and notarize the agreement papers and return it to the company who is buying the structured settlement payments, but understand that even at this point, after you have already signed an agreement, you may legally not obligated to sell your structured settlement payments and the company should not imply to you that you are. In fact, the company should notify you of your right to back off the deal at any time before the before court hearing is taking place to approve of the sale. The buyer of structured settlement payment rights is also obligated in most states to advise you on seeking "independent professional advice," that you may or you may not be entitled to waive, depending on the state laws. 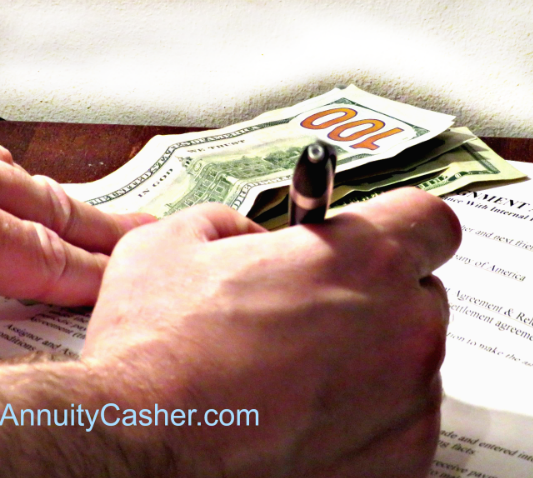 Are you in need of cash and want to sell structured settlement payments? Trust the Experts. We Are a REAL Insurance Agency!